Speed: With quad-core Intel processors, solid state hard drives, and broadband internet, the Lab computers are blazingly fast. Safety: Web browser cookies and history are automatically erased when you end your session, keeping your personal data safe. Anti-virus software is updated continuously throughout the day. 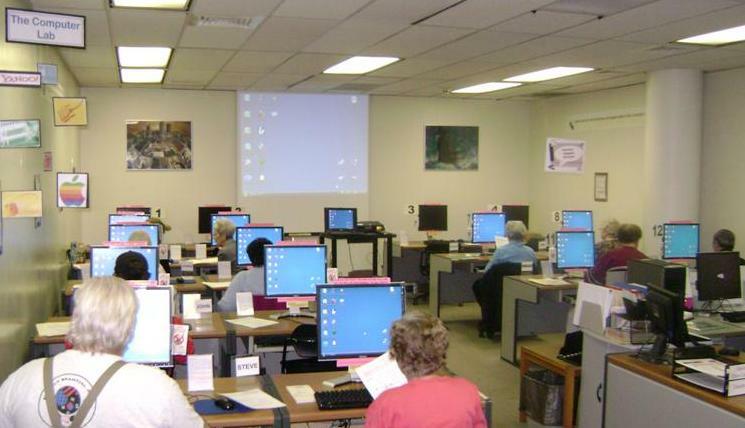 Service: Staff is here to assist with technical issues, such as how to print and save files. 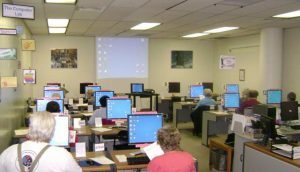 Library volunteers are available for additional one-on-one computer support. The Computer Lab is located on the first floor of the Library, next to the main Circulation Desk. We have 16 computers at comfortable sit-down workstations. We are open for public-access computing during the same hours that the library is open with the exception of the last half hour of each day and the occasional closure for computer classes. To use the Computer Lab, you’ll need a library card in good standing, meaning no overdue materials or fines. You will need an internet sticker on your card, given at the main Circulation Desk. If you forget your card or are just visiting for the day, with proper I.D. you can get a day pass. You are guaranteed at least one half hour on a computer. When we are busy, users are rotated out depending on who has been using a computer the longest. If you get rotated out, you can come back in a half hour. We don’t limit how many times you can come back.